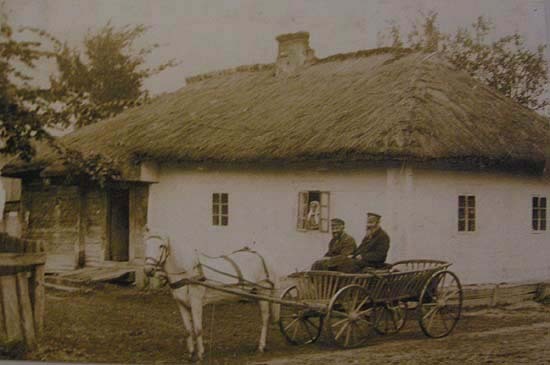 I have read with great devotion one of the most recent posts by Studiolum on the photos of Menachem Kipnis taken on his Jewish contemporaries in Poland. As he was a collector of folk music, it is no wonder that he took so many pictures on Jewish musicians, cantors and gramophone-winding beggars. Had I known beforehand that Studiolum was working on such post, I would have sent him some almost a century old cantor’s song recordings to illustrate the pictures and to revive the figures on them just as the waltz by Chopin has ensouled the house in Cracow. Even if I have come too late to that, nevertheless I would like to share some melodies, videos and stories with our readers about the cantors featuring personally or indirectly on the photos of Kipnis. The first one will be Yosele Rosenblatt of whom if not the voice, but at least the gramophone reproducing it and the beggar taking it around on a worn-out push-chair was immortalized by Kipnis. Although Rosenblatt was born in the Ukraine, nevertheless he belongs a little bit to us Hungarians as well. He was eighteen when, in 1900, he became the hazzan, cantor of the community in Munkács (today Мукачево, Ukraine). Later he went to Pozsony (today Bratislava, Slovakia) and finally in 1912 he emigrated to America. There his Hungarian relations were not cut either: he became the cantor of the Hungarian Jewish community Ohab Tsedek in New York. With his fantastically flexible, skillful and expressive tenor voice he could have had a brilliant career as an opera singer. They say that Toscanini himself invited him to sing the title role in Halévy’s opera La Juive. Rosenblatt, however, refused the invitation with self-confidence by saying that he dedicated his voice exclusively to the service of God. This service – and a number of invitations to a cantor’s concert tour – brought him in 1933 to Palestine as well where he played himself in the film The Dream of My People. The last video is the most dramatic one, as it has recorded the very last appearance of Rosenblatt. Some days after having sung the Yiddish song Aheim (At home), he died in a heart attack. He was buried on the same Mount of Olives which is shown in the background in the first seconds of the above video. The second part of the clip shows the huge crowd gathering at the funerals of the renowned cantor. Towards the end of the film an interesting historical document is the presence of the British cavalry of the mandate covering the event. At the funeral of this great cantor prayers were chanted, very suitably, by two other renowned cantors who had similarly set out from Eastern Europe and made their career in America, and who by chance happened to be in Palestine at the time of the tragic event. One of them was Zavel Kwartin, born in the Ukraine, who from 1908 until his emigration in 1919 was the cantor of the Dohány Street Synagogue in Budapest. 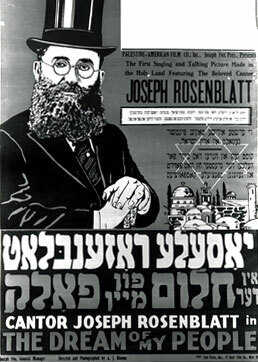 Between 1926 and 1936 he lived in Palestine where besides the synagogue service he also performed at several concerts. The name of the other cantor may sound familiar to the attentive readers of Río Wang: it was that Mordechai Hershmann whose childhood house and his aunt looking out of the window of the house was also photographed by Kipnis. Hershmann, born in Eastern Galicia, made his career – similarly to almost every promising talented young cantor – in America, having emigrated to New York in 1920, after some years of cantor’s service in Wilno (today Vilnius in Lithuania) and military service in Russia. Similarly to all his renowned colleagues, he also went on concert tours even as far as Southern America and Palestine where he was caught by the news of the unexpected death of Rosenblatt. The Podolian Gershon Sirota was the only exception among the celebrated cantors of the early 20th century who, in spite of his brilliant European career and successful concert tours, never took on a stable cantor’s position in America. Between 1927 and 1935 he continuously performed at concerts both in the Old and the New World, and in 1935 he accepted the offer of the cantor’s position in the Norzyk Synagogue of Warsaw. In 1943, shortly before his seventieth birthday he fell victim, together with all his family, to the Nazis in the ghetto of Warsaw, thus outliving only by one year Kipnis who had taken his picture and who also died in the ghetto of Warsaw by a stroke. The fame of Sirota’s forceful and expressive tenor voice has reached far outside the walls of the synagogues, also due to the fact that he – in contrast to Rosenblatt – did not shrink back from performing opera arias either. 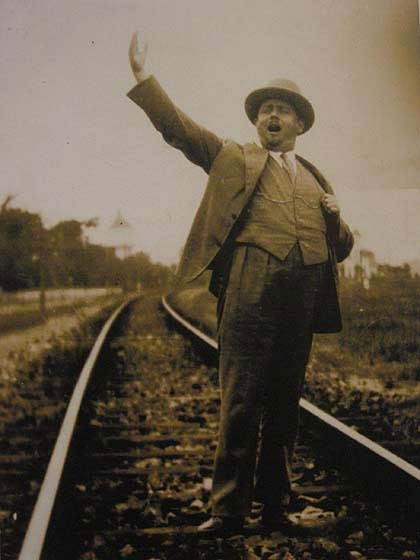 Caruso, on listening to one of his performances, allegedly gave thanks to God in prayer for the fact that Sirota had not chosen the opera theater to unfold his exceptional talents. To the illustration of these talents I have selected if not the most characteristic, but certainly one of the most peculiar recordings of him. We see the renowned cantor for some minutes in the Yiddish film Dybbuk which since then has won a historical fame to itself. The film was shot in Poland in 1937 on the basis of S. Ansky’s play of the same title. Besides Sirota’s expressive voice, the film is also made particular by the images of Cracow’s famous Jewish quarter Kazimierz. What a impressive journey among voices, lives, stories and souls. What a beautiful collection of archive recordings, and how perfectly matched with the old photos of the cantors! Just a question, since you have mentioned in each case the refusal or acceptance of singing opera arias: Was there any costume or recommendation for Eastern European Jewish cantors not to sing in the opera and/or in profane concerts? I think that may just have depended on how orthodox they were, but I'm no expert. I agree that it's a great piece of research to have found recordings for the photographs of Kipnis. I especially enjoyed the singing of Mordechai Hershmann. I am not aware of any prohibition again or disapproving of singing of operatic arias by cantors, at least not in those more progressive congregations which these cantors frequented. On the contrary, it was quite normal in those days that hazzanim also performed opera arias at their concerts, which requiered quite the same kind of voice, vocal technique and expression. In this regard even Rosenblatt was not as holy as he want to appear. He did appear publicly at several profane venues, like the New York Hippodrome Theater, singing among others the Élégie of Massenet - in Yiddish... There even exist a recording of it. Thank you! Yes, indeed Hershman has a very expressive and powerful voice and way of singing. I had problems with my pc speakers before. Now I can finally listen this post. ¡Wonderful! I enjoy it very much. Our troops standing at Gaza!